SharePort turns the local USB port located on the back of the 802.11n family of Wi-Fi routers into a fast and responsive virtual port so users can access a range of USB devices, by utilizing a new technology of USB over TCP/IP. D-LINK NOW SHIPPING COST-EFFECTIVE DUAL BAND 802.11n Wi-Fi ROUTER WITH SharePort(tm) TECHNOLOGY FOUNTAIN VALLEY, Calif., Oct. 1, 2008 - D-Link, the end-to-end provider of network solutions for consumers and business, today began shipping an Xtreme N(tm) Dual Band Gigabit Router for the home or small office, featuring dual band access that simultaneously creates two networks to provide superior clarity, faster Wi-Fi and wired gigabit speeds and HD Fuel(tm) enhanced Quality of Service (QoS). The D-Link(r) DIR-825 also features SharePort(tm) technology that allows users to share USB devices such as printers, multi-function printers (MFP) and storage drives with other computers on the network — in either a wired or wireless environment. SharePort turns the local USB port located on the back of the DIR-825 router into a fast and responsive virtual network port so users can access a range of USB devices regardless of their location in the home or office. With the power of 802.11n Wi-Fi technology, D-Link's latest addition to its Xtreme N wireless family allows the user to check email and browse the Internet on the 2.4GHz band while simultaneously streaming high-definition (HD) movies and other media on the 5GHz band, making it ideal for online gaming applications on the PC and gaming consoles such as PS3(r), Xbox 360(r) and the Nintendo Wii(r). The latest offering in the D-Link Green(tm) family of routers, the DIR-825 integrates D-Link Green Ethernet(tm) technology that uses an innovative, energy-saving feature that automatically detects link status and network cable length, then adjusts power accordingly. D-Link routers also feature Wi-Fi scheduling that allows customers to easily program when the Wi-Fi radio signals are turned on and off to further save energy consumption. With the router's powerful new HD Fuel technology users can enjoy the clarity of the 5GHz wireless band while benefiting from intelligent quality of service ideally suited for streaming HD media and for other bandwidth-intensive applications such as online gaming applications. HD Fuel takes wired and wireless data traffic, categorizes and separates it into multiple data streams and assigns priorities - Voice over Internet Protocol (VoIP), video streaming and online gaming are given priority over Web browsing, for instance. The dual band capability helps to enhance speed even more by using the 2.4GHz band for regular computer applications and the 5GHz band for larger, more intense data transfer. "By expanding our Xtreme N wireless router product line, we are further meeting the consumer's need for full Wi-Fi network functionality and reliability for powering their digital home at prices they can afford," according to Steven Joe, president and CEO, D-Link Systems, Inc. in Fountain Valley, Calif. Key Features and Benefits ? Xtreme N technology for farther home or office coverage ? Support for advanced WPA and WPA2 encryption, advanced firewall and parental controls for maximum security ? 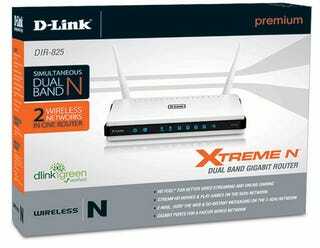 D-Link's Quick Router Setup Wizard for easy installation and online access ? Good Neighbor Policy support to prevent interference with other wireless networks ? Backward compatibility with 802.11g, 11b and 11a devices, including game consoles and digital media players. ? Compliance with D-Link's ongoing Green initiatives to promote energy conservation and environmental protection ? 24/7 basic installation support ? One year limited warranty Price and Availability The DIR-825 will be widely available Oct. 1, 2008 through D-Link's network of retail, etail and solution providers, and online at www.dlinkshop.com for the manufacturer's suggested retail price (MSRP) of $199.99. SharePort also will be available in D-Link's family of high-end 802.11n routers, including the DIR-628, DIR-655, DIR-855 and DGL-4500**. Current owners of those routers will be able to upgrade to SharePort technology by downloading the firmware and client utility from the D-Link website, www.dlink.com.